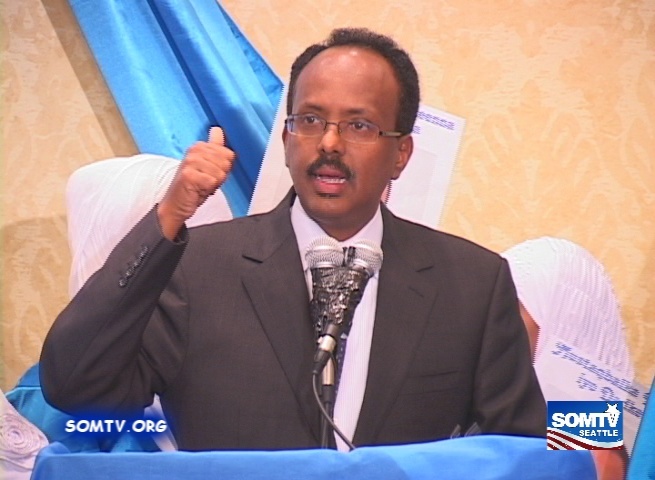 The talking points around Wednesday’s Somali presidential election have been dominated by corruption. But war is the best breeding ground for corruption. So why is the international community ignoring security and obsessing about corruption? From the land of only bad news came some welcome good news this week and who can begrudge Somalis for enjoying the party while it lasts? When Mohamed Abdullahi Mohamed was declared the winner of the 2017 Somali presidential election Wednesday night, the jubilant response was heartwarming. Celebratory gunfire erupted on the streets of the Somali capital of Mogadishu. In neighbouring Kenya, where hapless Somalis have waited out more than two decades of war, deliriously happy residents in the border city of Garissa and Nairobi’s Eastleigh district (also known as “Little Mogadishu”) jumped on convoys of honking vehicles or simply ran, waving Somali flags and singing, “Somalia hanolato” (Long Live Somalia). Newly elected President Mohamed – better known as “Farmajo” due to his childhood passion for cheese – had beaten the odds. His opponents were better funded, with powerful regional and international backers, many of whom had representatives at highly secured Mogadishu airport complex, where the entire election exercise was conducted. “Outside forces like Turkey, Sudan, the United Arab Emirates and Qatar are widely believed to have been buying off presidential candidates to land juicy business deals, spread a harsh version of Islam or spy on American forces,” noted a New York Times article published a day before the February 8 election. In the lead-up to Wednesday’s vote, the New York Times article, aptly titled, “Fueled by Bribes, Somalia’s Election Seen as a Milestone of Corruption,” set the talking points for news anchors clueless about the Horn of Africa nation who suddenly found themselves confronting Somalia experts on live TV. A report, also published on Tuesday, by the Mogadishu-based anti-corruption group, Marqaati, supplied the most-cited description of the 2017 vote as “the most expensive vote-buying campaign in human history”. Corruption dominated the news agenda before and after the election. It was C-word central time: How corrupt was the election? How corrupt was the winner? How corrupt were his opponents? If the winner was not corrupt, how did he win? Did that mean Somalia was not corrupt? Did it mean Somalia was inherently corrupt, but dropped its default setting for a day? How did that happen? True to form, the international community’s response to the vote also banged on with the old theme. "We encourage Somalia's new administration to take credible steps to stamp out corruption and to establish strong electoral institutions to enable a free and fair one-person, one-vote poll in 2020," US State Department spokesman Mark Toner said as the US congratulated Mohamed. The UK will be hosting yet another London conference on Somalia later this year and the favourite British talking points of foreign aid, fraud and corruption will once again dominate the proceedings, so that discourse is set to continue in the months to come. The long-delayed presidential election was initially supposed to offer Somalis universal suffrage, also known as “one-person, one-vote”. But given the security and logistical challenges of conducting an election in Somalia, the international community hammered out an unique clan-based system, a very Somali affair, that had clan elders select the 14,000-strong electorate, who in turn voted for 275 members of the lower house and 54 senators. In other words, the country’s confounded clans, which the old, “modernizing” autocrat Siad Barre tried to eradicate nearly half-a-century ago, got some international support. The age of the strongman is over and the Western-backed, post-conflict rebuilding mission is using primordial identity band-aids to try to hold it together. They tried to compensate for this essentially retrograde, elitist arrangement by mandating a large electorate of 14,000, which included 30% seats reserved for women. The hope was that with such a massive electorate, the influence of clan elders would be minimised. What perplexes me though is the failure to address the root of the problem and that’s security – or the lack thereof. Expectations of the Somali presidential polls were so low, everybody can’t seem to get over the shock of the least-corrupt candidate emerging the winner. At the risk of raining down on the election party though, it must be said that Wednesday’s election was not a free and fair democratic exercise, but a compromised affair because the nation remains at war. Al Shabaab is still around and is still making its presence felt. That’s why the election was conducted in a high security airport compound and that’s the reason why every Somali citizen did not get the right to exercise his or her franchise. Six years ago, when a famine ravaged the breadbasket regions of southern Somalia, sending tens of thousands fleeing from al Shabaab-controlled areas, we were all wondering if it finally spelt the end of the al Qaeda-linked group. Then Kenya launched its cross-border Operation Linda Nchi, which literally means cutting the head of the snake. But the snake turned around to bite Kenya when al Shabaab conducted the deadly Westgate shopping mall attack. Kenya then rolled its military operation into the African Union Mission to Somalia (AMISOM), which has been on the ground for the past decade and has yielded mixed results. Goodbye AU troops, hello – what? Militarily, AMISOM succeeded in wresting control of Mogadishu and other key southern port cities from Shabaab control. The Somali terrorist group has proved to be extraordinarily resilient and fantastically adaptable, and it continues to undermine security across the country. A day before the election, mortar rounds shook the Somali capital, over the past few month, al Shabaab attacks on AMISOM bases have been getting increasingly brazen and deadly. As Ugandan, Burundian and Kenyan soldiers get steadily killed or injured in Shabaab attacks, the one constant theme from AMISOM has been the lack of funding and resources. International military commitments are not met, African member nations lack the resources, the EU has cut funding, the US is on drone strike mode, and the saga continues with such monotony that no one pays attention anymore. But wait, the worst is yet to come. The 20,000-troop strong AU mission in Somalia is currently withdrawing troops and plans a total pullout by the end of 2020. The chatter in international circles is all about leaving it all to the Somali national security forces. Everybody knows there’s no such thing and that a spanking, professional Somali army is not about to materialize in three years. But nobody wants to talk about it. Instead, the anti-corruption guys are dominating the discourse. Yes, of course corruption is a huge problem. But it pales in comparison to the lack of security. History has shown, time and again, that war and insecurity are the best breeding grounds for corruption. After nearly three decades of conflict, what seems like corruption to some is just business for others. The strong and wealthy win, the weak and poor lose, sure. But in war, guns -- or access to guns – dictate the terms while accountability is the stuff of seminars and conferences funded by deliberately obtuse stake-holders. There also happens to be funding in the global anti-corruption industry and while that provides some employment to educated elites in the local NGO sector, it does precious little for the nation because the nation does not exist. For that to happen, al Shabaab must be dealt with. They may be a brutal, bigoted bunch, but they are Somalis and the ones that can be coaxed back into the political fold must have the opportunity to do so. Until such time, troops are necessary to maintain security. If they go, or are not up to the task, there will be no nation to speak of and Somalis will continue to employ an informal system of patronage and payments that smells like corruption to us, but is just survival for them. And that’s the bad news still lurking around the corner once the post-electoral party winds down.